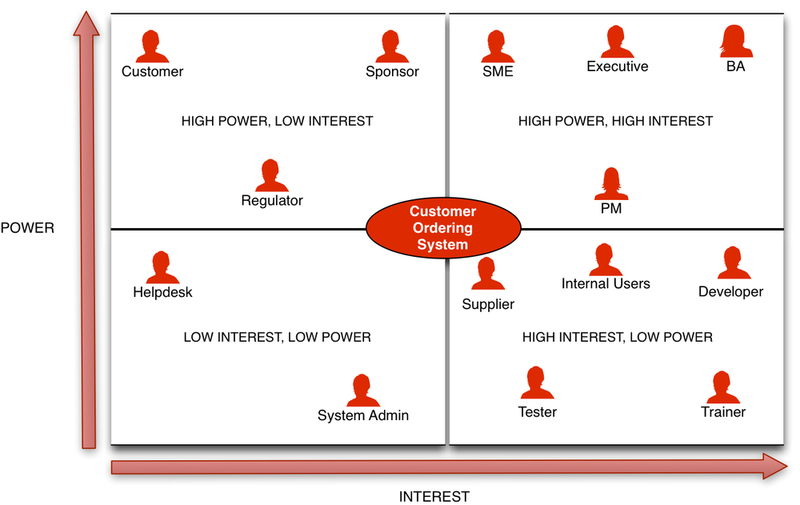 According to Mendelow's Power-Interest Grid, all stakeholders are not created equal. They differ in terms of their power over and interest in your project. So, how do you manage the different categories of stakeholders? This is where the Stakeholder Matrix comes in. Stakeholder analysis is so key to the success of projects that BABOK recommends stakeholders be managed throughout the project life cycle. Useful When: Identifying stakeholder power, attitudes and interests in the project. Stakeholders are extremely dynamic and may move all over the matrix when their interest/power changes. Monitor them continuously and move them round the quadrant as their interest/power evolves. For stakeholders with low power and low interest, they should be monitored with minimal effort. For stakeholders with low power and high interest, the BA should keep them informed constantly. Stakeholders with high power and low interest should be kept satisfied while the BA should work closely with stakeholders who have a high power over the project and a high interest in it. While this matrix is extremely useful in determining the frequency of communication with various stakeholders, it may result in a situation where the analyst pays more attention to certain stakeholders to the potential detriment of others. Analysts must understand that while the model provides a great starting point for the initial unravelling of stakeholder complexities, interest and power do tend to change with changing circumstances. As such, I would rather monitor all my stakeholders with the same level of effort to prevent nasty surprises down the line.